OUR CUISINE, INFLUENCED BY A PASSION FOR FARM-TO-TABLE OFFERINGS, IS BILLED AS "MODERN AMERICAN SMALL PLATES." Not holding to any particular cooking genre or style, but rather focused on the CREATIVE, WHIMSICAL AND DELICIOUS, Swift’s Attic is most recognized for their “R&D” style approach to producing the ever-changing menu, a carefully curated, farm to table whimsical take on American offerings that proudly showcases a melting pot of flavor profiles and influences. Not to be outdone, the bar features 14 draft beers, with most being sourced locally, in addition to an entire catalog of bottled beers, 24 by-the-glass wines served from a state-of-the-art cruvient system, and an innovative craft cocktail program, supplemented by an ice tap that pours four ice-cold liquors instantly. Swift's is located on 3rd and Congress, above the nationally recognized Elephant Room, on the second floor of the historic downtown Austin building that originally was the 1905 home to the Swift's Premium Food Co. Built to be comfortable yet exciting, Swift's Attic was designed to accent the space's natural historic beauty and character, while bringing modern elements and conveniences to our guests. The restaurant, opened by C.K. Chin and Stuart Thomajan, offers an ebullient escape from the bustling city streets below, and the restaurant group has become “one to watch” among Austin diners. 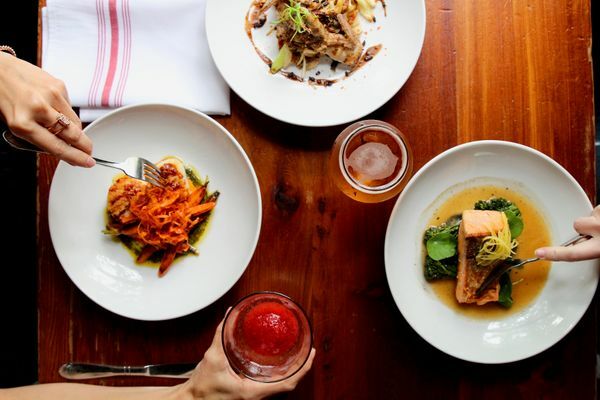 Swift’s shareable small plates menu has been warmly embraced on local, regional, and national levels, having been nominated for Food & Wine's People’s Choice Best New Chef in 2013 and 2014 and Best New Pastry Chef in 2013. The restaurant has been featured numerous times in DETAILS, Wine Enthusiast, Texas Monthly, Austin Monthly, Garden & Gun , and many others found on our Press page, in addition to an appearance on the Bravo network’s Best New Restaurant series. Hausbar Farms | La Belle Vie Farms | Tenderbelly | Hill Country Dairies | Broken Arrow Ranch | Joe's Organics | Windy Hill | Dos Lunas | Ranger Cattle | La Flaca | and our constantly growing list of organic producers for providing our antibiotic and hormone-free beef, chicken, and farm fresh local vegetables to serve you each day.